Don’t forget about the cattle. They have plenty to stress over. 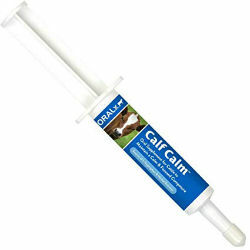 Calf Calm is a high-quality supplemental source of L-Tryptophan and Herbal Extracts. Oralx nutritional supplements are specially formulated to keep ingredients fresh and potent over their long shelf-life without refrigeration. Highly palatable and easy to administer from its handy dosing syringe. Simply depress plunger to deliver a measured dose to the back of your calf’s tongue - one mark on the plunger for each 100 lbs. of body weight. Feed 4 hours prior to exercise, competition, event, or transport.